At the top of a warm dry cycle, you get scams and fraud. Lots of it. This is what has happened all through history at each 515 year cycle temperature high. Once again, as at about 1500 AD, society is breaking down and moving more rapidly towards anarchy. We’re transitioning into a cold cycle, and the signs are all around us. 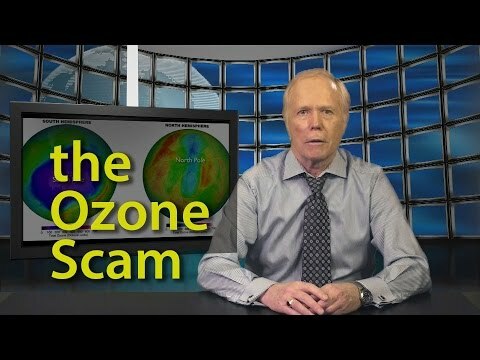 The ozone scam was precursor to the man-made warming scam, which is yet another way for governments and private interests to benefit by stealing wealth from the middle class. DuPont was the main party to benefit from banning the use of Freon, as they were losing their monopoly on the product. Governments also ended up benefitting through increased taxes. The other culprit is the media. These days, there are very few investigative reporters, and very little “real news” that hits the airwaves. Most of the pretty faces that grace our screens are simply teleprompter “readers.” News programs have now become “infotainment.” Media outlets are so apathetic, and stories manipulated, that anything of importance (or that costs money to pursue) never even makes it to the cutting room floor. Freon can’t possibly find its way into the stratosphere, because Freon molecules are over 4 times heavier than oxygen molecules. That’s simple physics. Freon will not rise into the atmosphere. You’ll find free-ranging freon molecules at ground level, but not much above it. The reason the North and South poles show levels of ozone depletion is because creating ozone requires sunlight and the two poles are the darkest places on Earth! The South Pole is devoid of light for more than half the year. There really isn’t any such thing as an “ozone layer.” It’s really just a thin area where oxygen meets ultraviolet light from the Sun. It’s been compared to the beach, where surf meets the land. It’s a thin “membrane” where ozone forms and then reverts back to oxygen, a chemical reaction that happens over and over again. Freon is an inert gas. It doesn’t break down under natural conditions. So even if it did somehow find its way to the stratosphere, chlorine atoms would remain locked inside it. The level of ultraviolet radiation hitting the Earth has not changed significantly since we discovered the ozone layer (and the hole over the South Pole). See the links below for more of that data on this fact. The strangest part of the entire ozone scam is that there are two types of ultraviolet radiation. Ozone screens out UV-B. But, “it is not UV-B that causes malignant types of skin cancer, but UV-A, which is not screened out by the ozone layer.” UV-B is harmless to humans. 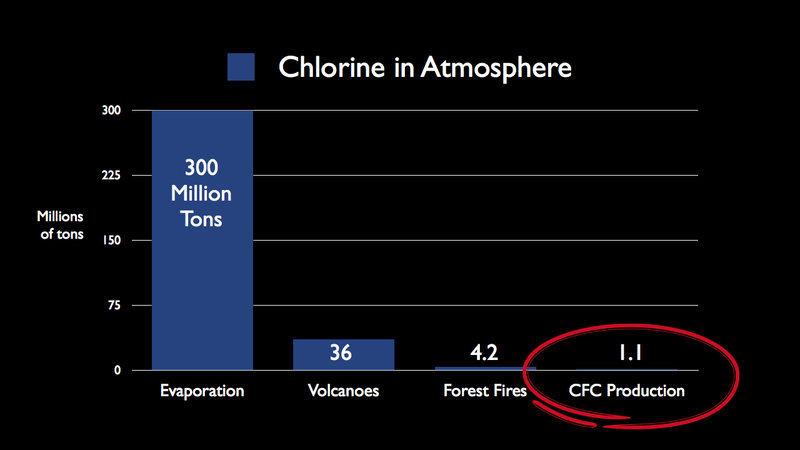 Natural chlorine atoms in the atmosphere, created primarily by evaporation of sea water, outweigh all the Freon man could produce by many hundreds of times. We could not produce enough man-made product to have any appreciable effect on ozone in the stratosphere. And finally, if man-made Freon were the culprit for “ozone holes,” why are these holes only over the poles? Were we using too much air conditioning or spray-on deodorant in the coldest parts of the planet? This particular scam is so ludicrous, it has absolutely no basis in science or logic. This is the kind of fraud I see all over the place, and it’s usually a bi-product of a warm dry cycle. When warm-dry cycles turn colder, as they always do, they lead to a major revolution and financial collapse. These scams are perpetrated by the “merchant class” on the masses, as they have been throughout history. It’s a natural economic and cultural cycle that eventually gets exposed. The good thing is that every major cold-dry cycle (and ensuing collapse) results in a win for democracy and freedom. But the road to get there is always a very difficult one. Looking for the truth? Read Peter’s stuff! The problem with climate change is that it is ideological. The left really believe in this stuff. I think of communism a la Stalin Mao, kill the apostates who dare to question. 50 million dead! The left is so secular they do not like things like natural cycles. It could indicate something outside human control. So they are willing to sacrifice economic well being for their beliefs. Of course they are just fine in their guarded gated communities. Kerry’s statement that air conditioning is a greater threat than ISIS. Of course we the great unwashed who deny science can only be pitied by the most great leaders.